One of the hottest topics in high-end audio these days (ca. late 1998) is the choice consumers now face between buying high-quality CD-only playback gear, or the array of new DVD-based systems capable of handling 24-bit/96kHz audio, DVD movies, and CDs. Put that way, the answer would seem obvious. But con fusion is still common among audiophiles and manufacturers: How compatible will these high-resolution DVD Video/-Audio systems be with the newly released DVD-Audio specification? And what about copyright restrictions on two-box playback solutions? ‘Will record companies allow 24/96 versions of their material to be transmit ted “in the clear” between a transport and separate processor? Uncertainty over these issues, and lingering questions about how well these multi-format systems will play CDs, have led to a depression in the sales of quality digital playback systems. The Muse Model Eight DVD/CD transport and companion Model 296 digital processor reviewed here represent perhaps the first high-end two-box systems to meet the nearly universal play back requirements described in my opening sentence. The official debut of this system —and the impending release of similar products from a number of other manufacturers — should ease the fears of those shopping for a new digital rig during this period of transition, especially now that the DVD-Audio spec is no longer a mystery (see my interview with Muse’s designer, Kevin Halverson, elsewhere in this issue). Like all Muse audio components, the chassis of both the Model Eight transport and the 296 processor trade some of the glamour found in many cost-no-object models for an understated, straightforward, yet still attractive design. Both enclosures are entirely plated in conductive zinc, then selectively painted on the exterior surfaces so that, when assembled, all mating surfaces and folded flanges form a tight EMI shield inside and out. Exposed zinc-plating of all interior surfaces also provides a handy low-impedance contact point for internal grounding of critical circuitry. Shown above: Muse Eight DVD/CD transport and 296 DVD/CD processor. A clean and handsome machined aluminum faceplate (available in either anodized black or brushed silver) graces both components. The transport’s front panel includes a central disc drawer with a gently curved, machined aluminum cover; the requisite operational buttons; and a blue vacuum-fluorescent display (VFD). A rocker-switched IEC power inlet on the back panel contains a robust EMI filter to minimize contamination of the power line by the many clocks found in a DVD transport. Other rear connections include S-video and BNC composite-video outputs for connection to a monitor, a BNC—S/PDIF connector for linear PCM/AC-3 audio outputs, and the paramount 13W3/I2S interface connector. Audio interfaces: BNC-S/PDIF, Universal I2S (supports encryption). Front- loading, dual-focus mechanism (655nm-wavelength laser) capable of playing single- or dual-layer discs. Video interfaces: BNC composite video (1Vp-p), DIN S-video (Y: 1Vp-p; C: 0.286V p-p). Dimensions: 17.2” (43.7cm) W by 3.5” (88.9cm) H by 13” (33cm) D.
Weight: 18 lbs. (8.2kg) net. Price: $3500 including 13W3 cable. Model 296 24-bit/96kHz fully balanced digital processor: Audio interfaces: BNC—S/PDIF, AES/EBU (pin 3 positive), Universal 125 (supports decryption), all capable of 96kHz data rates. Digital filter: programmable 24-bit fixed-point DSP engine. Analog outputs: unbalanced (2V RMS) and balanced (2V RMS). Common to both: Approximate number of dealers: 35. Warranty: 3 years parts and labor, 1 year on DVD mechanism (requires completion and return of mail-in registration form). Manufacturer: Muse Electronics, Inc., Garden Grove, CA 92842. USA. The heart of the Model Eight unit is a Matsushita-sourced DVD-Video/CD mechanism and companion main board. This drive is equipped with a dual-focus, single-laser mechanism so it can zero in on either a CD or DVD, each with data layers at different depths from the disc surface. The main board is an impressive four-layer printed circuit board that’s packed top and bottom with DVD decoder chipsets, a video DAC, and several stages of the static and dynamic RAM and EPROM modules required for audio and video processing. Halverson chose the Matsushita DVD mechanism/main-board system over competing alternatives due to the topology of the decoding chipsets. The layout of this board not only facilitated Muse’s handling of the variable clocking functions required for DVD-Audio, but was particularly well suited for the modifications required to relocate the master clock to the processor while slaving the transport to the 296 (or to another compatibly equipped DVD processor) via the dedicated Universal I2S transmitter module and cable. Halverson noted that the care and handling required to maintain the integrity of the clocking signals right through the output of the transport is of primary importance in achieving high- quality audio results. In his opinion, this is far more critical than the mechanical characteristics of the transport mechanism itself (although he claims that the Matsushita DVD-spinner is robust and well designed). Hence the effort applied throughout the Model Eight to ensure minimal data and timing errors. An inherent feature that should make the mechanical performance of a DVD drive relatively less important than that of its CD counterpart is that the data from the DVD device is clocked out via a whopping 16Mbyte buffer compared with the minuscule 1kbyte buffer found on most CD transports. These drive- units should be comparatively immune to mechanism-induced jitter resulting from vibration or similar errors. Directly behind the drive mechanism is a Matsushita-supplied video display board with the S-video and composite- video circuitry. Muse is considering offering component video as a future option, but is more interested in a direct digital link to future digital televisions; they feel the S-video link provides excel lent movie playback as is. The Eight’s inside front panel contains two addition al circuit boards: one by Muse to handle the front-panel controls, the other from Matsushita, for the VF display. One of the dilemmas faced by a single-box design is how to control the rich tapestry of RFI hash generated by the many separate clocks required by a universal DVD player/transport. Unless great care is taken, this interference can compromise the analog output performance — see this issue’s “Industry Update.” To this end, the entire left half of the Eight is occupied by a robust linear power-supply board, this in place of the switching supply found in nearly all commercial-grade DVD-Video players to date. Halverson noted the tremendous challenge in designing a linear sup ply of this quality. On this board alone are three separate power transformers, over 28,000 of capacitance, and eight stages of regulation, delivering 13 different power-supply levels (from 3.3V to 25V) throughout the transport. Muse claims that the sonic and practical benefits derived from incorporating the Universal I2S interface supplied by Digital Axiom Corporation (see the sidebar in the Halverson interview), as well as the chance to include a linear power supply, are what justified the creation of the Model Eight in the first place. The 2 1/2”-square Universal I2S transmitter module is attached to the right rear corner, and is potted for thermal, mechanical, and intellectual property reasons. The Eight’s drive mechanism and main board can be replaced with little difficulty when, and if, multichannel DVD-Audio software becomes plentiful. I don’t review the Eight’s video performance here, but its linear power supply and other refinements produced a slightly sharper picture and better contrast on DVD movies than either of the two commercial-grade DVD players I’ve used. Though the Eight can play a wide variety of formats as is, Muse has ensured a relatively affordable upgrade path for both products. In particular, the Eight’s drive mechanism and main board can be replaced with little difficulty when, and if multichannel DVD Audio software becomes plentiful and enough audiophiles upgrade the rest of their systems to handle six or more channels of audio playback. 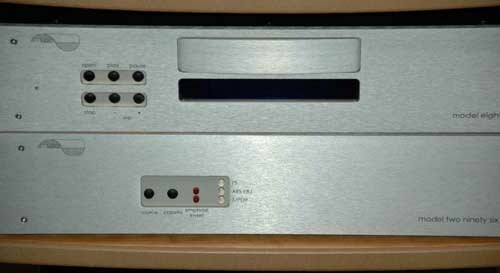 Since reviewing the original version almost four years ago (Stereophile July 1995), I’ve used a Muse Model Two, or an updated Two-Plus CD processor, as one of my principal digital references. In the conclusion of that review I under scored the Two-Plus’s inventive design, outstanding sonic bargain, and easy upgrade path as reasons for my purchase of the evaluation unit. With the introduction of the Model 296, Muse has honored each of those attributes — and then some. Owners of earlier models can convert their investment into a 296 for the difference between the units’ costs. However, the 296 is far more than a souped-up Model Two-Plus. Under the skin, it’s a whole new animal. The care Muse has taken in designing the Eight’s power supply has been applied to the 296: A pair of quality transformers split duties, one serving the digital input circuitry, DSP filter board, and front-panel controls, the other powering the DAC/analog board. Twelve separate stages of RC-filtered regulation are spread throughout the processor, including four discrete shunt regulators for the analog output stages. Approximately 60,000uF of capacitance provides plenty of power-supply filtering and bypassing. The 296 is far more than a souped-up Model Two-Plus. Under the skin, it’s a whole new animal. DSP-based digital filter and Universal I2S interface daughter-boards. Both plug-in modules are software-updateable, and are here potted in epoxy. Signals from the 13W3 connector bypass the Crystal input receiver entirely, traveling straight to the J25 module, where they’re locked to the system’s master clock — relocated there from the transport. The transport is thus slaved to the 296’s master clock, ensuring the lowest possible corruption from inter face jitter. Using either the AES/EBU or S/PDIF connections means routing the combined clock and data signals through the input receiver, while the master clock remains in the transport and the processor reverts to its typical slave role. Under the potting compound of Digital Axiom’s 24-bit/96kHz digital-filter module, surface-mount components support Motorola’s hot new 56303 DSP engine. This 80MHz processor is one of the few capable of 24- bit fixed-point operation, which allows it to process such signals without the round-off errors that can occur with a floating-point design. The 56303 can perform two instructions per clock cycle, and has roughly four times the processing power of the familiar 40MHz 56002 engine. More important, D.A.C. hired a skilled DSP engineer to craft a powerful and very deep FIR algorithm, claiming stopband attenuation better than -122dB and passband ripple of less than -134dB! Both figures are the best I’ve heard of for an audio FIR filter. This one is optimized for 8x-oversampling at 96kHz, 48kHz, and 44.1kHz. The Muse 296’s performance was measured from both its unbalanced and balanced outputs. The maximum output level at 1kHz was to specification, at 2V from either set of outputs. The single-ended source impedance was a low 50 ohms across the audio band. From the balanced XLR jacks, the source impedance was higher, at 266 ohms, but this is of no consequence. With the red polarity LED off, the 296 was noninverting from the unbalanced RCA jacks but inverting from the balanced outputs. As mentioned in the body of the review, this is because the XLRs are wired with pin 3 hot rather than the AES standard of pin 2. The channel outputs matched to within 0.1dB, which can be seen in the frequency-response graph (flg.1). At a 44.1kHz sampling frequency (top traces), the very slight rolloff above 16kHz from the unbalanced outputs is doubled from the balanced jacks. D emphasis error was negligible and is not shown. Driving the 296’s AES/EBU input with a double-speed datastream from a dCS 904 A/D converter sampling the Audio Precision’s analog out put at 96kHz produced the frequency response shown in the bottom traces of flg.1. The top rolloff continues at the higher sample rate, reaching —0.5dB at 44kHz, but dropping like a stone by the Nyquist Frequency of 48kHz. That the Model 8/296 combination does decode 96kHz-sampled data with out down-sampling to 48kHz is con firmed in flgs.2 and 3. 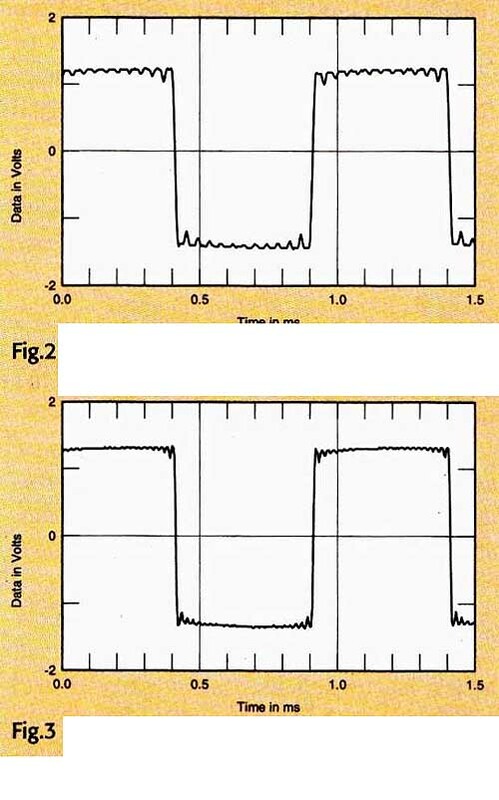 Fig2 is the wave form of a 1kHz squarewave at 0dBFS on the Chesky test DVD, sampled at 48kHz and played back on the Model Eight Fig.3 is the same signal sampled at 96kHz, and shows that the Gibbs Phenomenon “ringing” on the tops of the waveform is doubled in frequency, due to the doubled bandwidth. Fig.3 Muse 296. 1kHz squarewave at 0dBFS, 96kHz sampling. The Model 296’s channel separation (flg.4) was superb, at better than 115dB (right—left) above 1kHz from both unbalanced and balanced outputs. The crosstalk was about 10dB higher in the other direction, and also higher below 1kHz from the balanced outputs, partly due to higher power-supply noise in the balanced mode. The transport was placed on top of the processor for this measurement; it turned out that the power-supply noise was mainly due to magnetic coupling between the Model Eight’s mains transformer and the 296’s signal circuitry. For subsequent measurements I moved the transport well to the side of the 296, and noted a corresponding reduction in AC noise. (The moral: don’t place the units on top of one another.) Fig.5, for example, shows the spectral analysis of the Muse’s output while it decoded data representing a dithered 1kHz tone at -90dBFS. 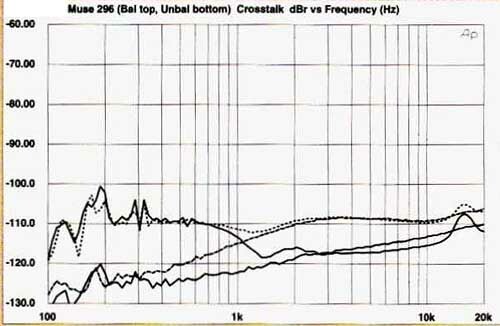 (The measurement was taken by slowly sweeping a 1 analog bandpass filter from 20kHz to 20Hz, which is why the graph’s noise floor appears to rise with frequency) The right channel’s noise floor is a little lower than the left’s above the 1kHz tone, and, with the exception of the peak at 180Hz in the left channel, the balanced outputs are slightly quieter. Fig.4 Muse 296, channel separation at 0dBFS, balanced outputs are top traces below I kHz (10dB/vertical div R—L dashed). Fig. 5 Muse 296, spectrum of dithered 1 kHz tone at -90.31dBFS, with noise and spuriae, 16-bit data; balanced outputs are top traces at 180Hz, bottom traces above 1 kHz (right channel dashed). Switching the digital generator’s out put word length from 16 to 24 bits resulted in noise-floor reductions of about 11dB (left channel) and 8dB (right). This difference can be sees in fig.6, which shows spectral analyses of the unbalanced outputs. (The output datum for this graph was actually a 10Hz tone at -96dBFS, which will give a truer representation of the unit’s noise performance than a “digital black” signal.) 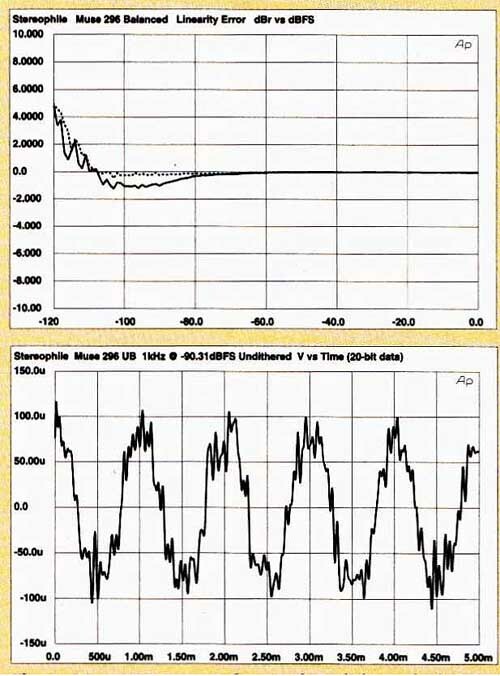 You can see a spurious peak in the right channel’s output at 1.2kHz in each of these graphs. Assuming it isn’t spurious interference picked up from the Audio Precision test set (which was probably the case with the small 2kHz peak), it might be an idle tone. 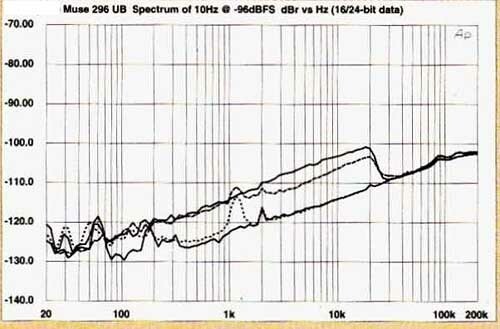 The balanced output (not shown) featured a slightly greater reduction in the noise floor when the word length was increased to 24 bits, implying slightly greater resolution from the balanced DAC arrangement. The linearity error of the balanced output is shown in fig.7. (The unbalanced output linearity was identical, within the usual margin of error) The left channel offers astonishingly good linearity almost down to -120dBFS. By contrast, the right channel features a 1dB negative error below —80dBFS. The Muse’s reproduction of an undithered 1kHz tone encoded with a 24-bit word length is shown in fig.8. There is more noise overlaying the waveform than I’ve seen with other high-resolution processors, perhaps due to the passive I/V conversion. (above) Fig.8 Muse 296, waveform of undithered 1kHz sinewave at -90.31 dBFS (24-bit data). [left] Fig.9 Muse 296, spectrum, DC-i kHz. 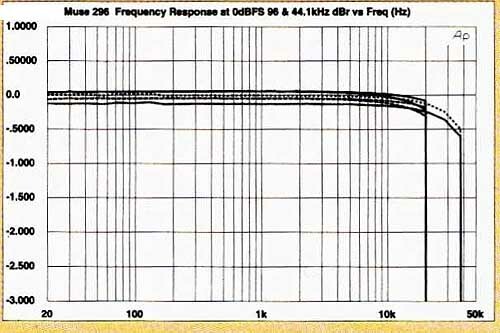 61Hz at 0dBFS, 600 ohm load (linear frequency scale. 20dB/vertical div.) [right] Fig.10. Muse 296, HF intermodulation spectrum. DC-24kHz. 19+20kHz at 0dBFS, 600 ohm load (linear frequency scale. 20dB/vertical div.). The Muse 296’s output stage could drive low impedances without breaking a sweat. Fig.9, for example, shows the spectrum of the processor’s output driving a full-scale 50Hz tone into 600 ohms. Almost all the distortion components are better than 100dB down. Similar is the processor’s handling of the punishing combination of 19kHz and 20kHz tones, each at -6dBFS. Fig.10 shows that, even into 600 ohms, the intermodulation products are well down in level. The 1kHz difference component is at —96dBFS. The Model Eight DVD transport would not play CD-Rs, so I was unable to examine the jitter performance of the Model Eight/Model 296 system. How even when the 296’s S/PDIF data input was driven by a PS Audio Lambda transport via 6’ of Apature interconnect, using an adapter to convert the cable’s RCA jack to the BNC required by the 2%, the jitter level —measured with the Miller Audio Research analyzer—was very low: 199 picoseconds peak—peak. Fig.11 shows a high-resolution spectral analysis of the 296’s unbalanced analog output, decoding the data from the Miller jitter-test CD-It The sidebands indicated by red “1” numeric markers are due to data-related jitter at ±229Hz. These contribute 138ps to the total. 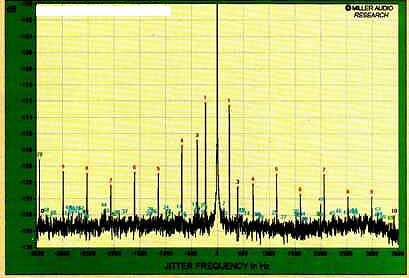 Higher-frequency; data-related jitter sidebands are all much lower in level. The sidebands indicated by purple “3” markers are due to jitter with a frequency of ±389Hz. I have no idea what these are due to. Finally, all the transports I have so far measured that use DVD mechanisms are much better than CD transports at coping with damaged CDs. The Muse Model 8 is no exception, playing through track 36 on the Pierre Verany Test CD, which has 2.5mm gaps in its data spiral, without muting or skipping. It even managed to play through tracks 37 and 38, though with skips and dropouts. These tracks have 3mm and 4mm gaps in their data, respectively. Fig.11 Muse 296, high-resolution jitter spectrum of analog output signal (11kHz at —6dBFS with LSB toggled at 229Hz), center frequency of trace, 11kHz; frequency range, ±35kHz. A key feature of this algorithm: When switching from 96kHz to the lower sampling rates, it automatically scales, based on the master-clock frequency of the inbound data, to maintain an ideal relationship between the digital filter and the 48kHz band width analog reconstruction filters downstream. Flexibility is inherent in a DSP design, and according to Halverson, Meridian Lossless Packing (MLP) will definitely be included as soon as the code becomes available from licensor Dolby. HDCD decoding is another possible addition, but is not currently supported. The first prototype of the Model 296 I auditioned in the summer of 1998 included the DAC/analog board from Muse’s Model Two-Plus processor, paired with incomplete I2S input circuitry and a rudimentary digital filter algorithm (this last intended only to serve as “proof of concept” for 96kHz playback at Hi-Fi ‘98 in May). While this early unit sounded good, the steady sonic gains following the installation of the master-mode I2S in August, and then the fully developed 8x-oversampling 96kHz digital filter in September, upped the 296’s CD performance to close to the best I’d heard by that point—not to mention what it did for 24-bit/96khz discs. Perhaps that’s why I was so floored by the significant further improvements I heard when the final-production 296, with its new DAC board, arrived the first week of October. The DAC/analog board is the same size as its counterpart in the original Model Two (to facilitate upgrades), but there the similarity largely ends. Once Kevin Halverson decided to use two DACs per channel in a balanced topology that made rejection of digital-based common-mode errors a top priority; he had to first select the specific complementary components to implement the chosen circuitry. Then, a critical, time- consuming calibration process was developed and applied to each 296 to compensate for variations in real-world tolerances and other idiosyncrasies through an iterative, multistage trimming process. All four DAC chips in the 296 are Burr-Brown’s newest, the Bi-CMOS PCM1704U-K. The “K”-grade 1704 is the best converter Burr-Brown now makes, said to exceed the performance of their vaunted 20-bit PCM63P-K in nearly every parameter. Though the 1704 is a true 24-bit DAC, that doesn’t mean it achieves a full 24-bit dynamic range, nor is that even the key performance issue. Rather, the four extra bits allow the DAC to seamlessly handle a 24-bit word from the digital filter, and provide some “overhead,” making it more likely that a processor can achieve near—20-bit linearity while greatly reducing low-level quantizing errors without resorting to dither or noise-shaping. Passive design also paid dividends for the reconstruction filter, offering the same lack of IM byproducts. Halverson applied his Impedance Equalized circuit to this filter to make the input of each successive stage look like a pure resistance to the output of the previous stage. This, in turn, makes a high-order filter possible without adding active buffers between stages. This fully passive 24dB/octave Bessel filter thus rejects a substantial amount of out-of-band grunge and imaging artifacts, yet maintains excellent phase linearity. After the reconstruction filters, each channel phase branches off, forming an extra pair of signals to feed the opposite- polarity inputs on two separate Burr- Brown INA-103 instrumentation amps. This cross-coupling provides the critical mode conversion discussed below — just prior to the output amplifiers. In contrast to a typical op-amp, an instrumentation amp, when properly implemented, has special properties that encourage very high common-mode rejection --in this case, even into the RF region, claims Halverson, specifying a common-mode rejection ratio (CMRR) of better than 80dB at 1MHz for the Muse 296. The INA-103 has extremely low noise and is optimized for high-quality microphone or moving-coil preamps, or within other low- impedance circuits such as that found in the 296. An LCR filter between the amplifiers and the XLR and RCA out puts completes the circuitry to ensure stability when driving long cables, and reduce RFI coupling to the outputs. After my previous experiences with 24/96 discs through a Pioneer DV-500 DVD player, I was confident that the high-end Muse gear would set a new benchmark of realism playing DVDs. But I wasn’t prepared for what they did for ordinary CDs. I consistently preferred the sound of recorded music played through the I2S. Model Eight and 296 front-end over that of any other source I’ve had in my home —including CD, DVD, or LP. The essential sonic characteristics of these components in my system included an unprecedented degree of focus and low-level purity. This, in turn, led to a remarkably accurate delineation of the scale and location of individual instruments and vocalists. This was not the kind of hyper-etched imaging, mixed with a fine grain, that quickly wears thin, but a beguiling combination of transparency of the acoustic environment and an astonishing resolution of fine harmonic detail that was never even slightly fatiguing. Driving the 296 via its I2S interface with the Model Eight was a bit disarming at first—it sneaked up on me. The sound was extremely refined, with all the action happening in the realm of nuance and subtle shading—all with the greatest sense of ease. This system seemed to add very little distortion of its own. As a result, I invariably heard a rightness of timbre and naturally proportioned perspective. Sonic images were often expressed with a spookily “visual” degree of boundary definition — I could effortlessly locate each instrument relative to others within the soundfield, without the slightest tendency for them to wander or “morph” in size or shape as the music swung through its range of dynamic expression. With good recordings, the illusion of solid bodies spread throughout the front half of my living room, and beyond, was stunning. And at either end of the music’s dynamic range I could clearly follow the fundamentals and related harmonic-decay characteristics of individual instruments without them smearing together to form the generalized “sound” of a particular instrument or group of instruments. Taken as a whole, these attributes give but a glimpse of the awesome macro-to-micro-dynamic dexterity of the Muse system. Plus, the stellar control, focus, and harmonic purity — the 296’s hallmarks —infused the quality of the bass and lower midrange with an irresistible rhythmic drive and tactile quality that added so much to my enjoyment of all kinds of music. It’s hard to overstate the impact this level if performance had on my emotional connection to even mundane CDs, whose music I now often appreciated as if discovering them anew. Though I listened to several other excellent processors, the Muses’ only close competitor for playing CDs was Sonic Frontiers’ superb Transport 3 and Processor 3 (T3/P3). 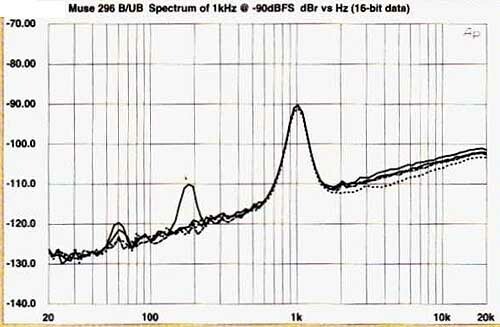 After reviewing the SF units for Stereophile (October 1998), I compared them to the earliest prototypes of the Eight/296; though those rudimentary versions were close in some respects, they definitely fell short of the T3/P3’s awesome transient definition, dynamics, and low- level resolution. But in digital audio nothing stands still. Comparing CDs through the production versions of the Muse system and a level-matched T3/P3 combo — the SF flagships still sounding their utterly gorgeous, seductive selves —the tables were turned. The Eight/296 now got the nod in the areas of accurate transient definition, image focus, resolution of harmonics, and localization of instruments. What still boggles my mind is that it was T3 and P3 themselves that had set new standards for me in these very areas just last summer. These were by no means night-and-day differences, but neither were they difficult to hear on my system, even when listening through their respective S/PDIF connections. The more complex and demanding the material, the more apparent these subtle variations became. Any CD will do, but try Bela Fleck and the Flecktones’ Live Art (Warner Bros. 46247-2). These engaging songs, filled with incredible dynamic punch, lightning-fast transients, and an enthusiastic live audience, clearly illustrated the relative qualities of the Muse and Sonic Frontiers systems. Through the SF gear, the artists and instruments were a bit more forward in perspective. The banjo and bass, though outstanding via the T3/P3, were also a shade more diffused and less solid, their strings appearing slightly “fatter,” or amorphous, com pared to the Muses’ tightly focused, holographic-like images. The more dif fused character of the SF gear made all instruments seem a shade larger and a tad more “round” than did the 296. Yet the expression of individual notes from the Processor 3 lacked that last measure of ultrapure resolution and transient delineation heard from the Muse processor. As a result, the tendency of fine textural details to coalesce was minimized through the 296, exposing the most delicate inflections and other subtle nuances that better create the illusion of musicians in space. Natural recordings played back through the Muse rig gave an impression of a slightly more laid-back acoustic space; and the sense of depth, such as a venue’s rear wall and corners, was more clearly defined. Sonic Frontiers’ premiere system is still unfailingly musical and engaging, and remains a close second in my book when playing CDs. In my opinion, however the price/performance bar has been raised. While the CD performance of the models Eight and 296 was a delightful surprise, the combo’s other mission in life is to extract all that the new 24-bit/96kHz stereo DVD recordings have to offer. Many of you have read about or have actually heard the genuine sonic advances this new format represents. If you pulled a Rip Van Winkle the past year, the best DVD discs recorded, encoded, and played back through 24- bit/96kHz hardware convey a sublime cohesiveness, sheer effortlessness, and a degree of envelopment that exceeds the very best examples of CDs and most LPs (assuming the rest of your system can keep up). Tonal colors have a vibrant naturalness, and cymbals now sound like round, dimensional objects with a shimmering spray. However, if a 96kHz-capable commercial-grade DVD-Video player has been your only source, you’re in for a real treat through high-end players like the Eight/296. to really hear what’s buried between the pits of DVD-Audio discs, all aspects of processor design need reevaluating to lower jitter and all forms of distortion, including —if the Muse designs are any example —digital sources of nonlinearity. Listening through the Muse system to such 24-bit/96kHz riches as “Summertime,” from Classic’s reissue of Earl Hines and Jimmy Rushing’s Blues & Things (DAD-1012), or the entire two- disc collection of Gershwin’s Works for Orchestra and Piano and Orchestra (DAD-1018) with Leonard Slatkin and the St. Louis Symphony, invariably stopped my world! That these recordings are just a drop in the bucket is truly exciting. Soon the majors will start pumping out audio on DVD discs, the majority of which should have at least two channels of 24-bit/96kHz material accessible by this system. Furthermore, this new format offers the first opportunity ever to bring near—master-tape sound quality into the home. Manufacturers of everything from microphones to speakers can use it as a guidepost for improving the rest of the recording/ playback chain. I also level-matched and compared my top-flight analog front-end with the Muse system, listening to Muddy Waters’ Folk Singer LP (Mobile Fidelity MFSL-1-201) and Classic’s new 24/96 reissue of the same (DAD1O2O), as well as the group of luscious 45rpm LPs Classic made as counterparts to their first five DAD releases. From both for mats I heard the same sense of alluring ease, openness, and rich tonal qualities we’ve come to expect from the best analog, as well as a general lack of the more pernicious limitations and enharmonic distortions that have always plagued CD sound. However, with the DADs through the 296 there was greater frequency extension and an absence of masking LP distortions, however pleas ant, along with a hard-to-define dynamic continuity that even the 45rpm LPs couldn’t match. No, I’m not about to sell my turntable and records—there are just too many treasures to have to part with. But in future choices between a hi-rez DVD or an LP of music I want, I’ll opt for the DVD in a heartbeat. My forensic autopsy of the sound of the Muse Eight and 296 falls far short of conveying just how thoroughly this combo has enhanced my appreciation of compact discs and of how hard it now is to stop listening to them — not to mention the impact of introducing an entirely new standard of reproduced music via DVD. No doubt, continued exposure to other new hi-rez DVD systems will help expand my lexicon of sonic analogies to better express their qualities. If even a fair number of these new components sound as good as this rig, it’s great news for everyone. It’s ironic that, just as the advent of CD inspired a revolution in the sound quality from LP, so, too, the design choices required to maximize 24- bit/96kHz playback have given birth to a modest and reasonably affordable DVD front-end that has infused new life into CD. I’ve bought more than 20 CDs in just the past month—a binge unlike any I can remember. Perhaps that says it best of all. The story, then, of the Muse Model Eight transport and the 296 processor is one of excitement and promise made good — not only for the present, but for more yet to come, as the various soft ware and hardware manufacturers rev up to follow Muse’s example. How appropriate, though, that one of the first two-box DVD-Audio/-Video solutions is from a small high-end entrepreneur like Muse. With its relatively modest $6500 total price tag, robust I2S inter face, modular flexibility, highly innovative design, and compatibility with the a wide variety of two-channel software, this system is here to stay. Analog source: Immedia RPM-2 turntable, UniPivot tonearm, Sounds of Silence Crown Jewel phono cartridge. Digital sources: Sonic Frontiers Transport 3 and modified Theta Data II transports, Pioneer DV-500 DVD/CD player/transport. Digital Processors: Sonic Frontiers Processor 3, Muse Model Two-Plus (CD-only), Theta Gen.V-a. Pre-amplification: Jeff Rowland Design Group Coherence II and Cadence phono stage, Z-Systems RDP-1 digital preamplifier, BAT VK-3i, Muse Model 3. Power amplifiers: Jeff Rowland Design Group MC-6 six-channel amplifier, battery-powered Model 6 monoblocks. Loudspeakers: Audio Artistry Beethoven Grand, quad-amplified system. Cardas, Audio Power, and Mango Reference power cords; Cardas AES/EBU, Kimber Select AES/ EBU, DH-Lab Silver Sonic BNC and AES/EBU digital cables. Accessories: Arcici Suspense isolation stand, Audio Power Ultra Wedges, Vibraplane and Newport Benchtop pneumatic isolation platforms, Townshend Seismic Sinks, Signal Guard platform, D'Feet isolation pucks, ASC Tube Traps. I want to take this opportunity to thank you for reviewing the muse Model Eight and Model 296 DVD/CD system. Your willingness to undertake the task of distilling and conveying complex issues, such as those surrounding a new format like DVD, is a characteristic not often found in the audio-reviewing press. The reviewer’s enthusiasm and technical abilities are rare traits that should be commended and encouraged, for they elevate the process of product review above the mere recitation of fact and opinion. That the reviewer found that he “consistently preferred the sound of recorded music played through the I2S-equipped Model Eight and 296 front-end over that of any other source” is a source of great pride and sense of accomplishment for me. As everyone involved in this effort can attest, the challenges were enormous and the tasks long and difficult, but with statements like “I’ve bought more than 20 CDs in just the past month — a binge unlike any I can remember,” the whole effort seems somehow validated. If the end result of our efforts is a pair of products that raise the expectation bar for recorded music, then I am truly pleased. ‘While all of the key technical features of these two products were mentioned in the review, I would like to further emphasize two salient features of our system. In the “Measurements” section accompanying the review lab-tester mentioned the slightly elevated noise floor of the 296 relative to that measured in some competing high-resolution processors. Tester surmised that this likely resulted from the use of a passive I/V topology within the converter. While his conclusion is fundamentally true, I should point out that the choice of this topology was essential to achieving the highest sonic performance for the following reason. While traditional steady-state measurements —such as signal-to-noise, THD, and TM distortion tests—do show many of a product’s characteristics, they fail to expose many of the random impulse events that are so common in digital converters. These errors manifest themselves as low-level, spectrally distributed, noise-like components derived from digital logic functions. Since these are truly random events, they’re extremely difficult to quantify by conventional measurement techniques. My goal for the 296 was to develop a circuit that would reduce these digitally based common-mode errors by use of a highly differential topology prior to them becoming converted to normal mode signals. This approach required that I reduce to a minimum the number of active stages immediately following the DACs. Once digital common-mode errors enter an active stage, most are converted to nor mal-mode signals and can no longer be rejected from the desired signal. As reviewer stated in the review, a passive I/V stage, followed by a high-order passive reconstruction filter, offers the near-ideal environment for realizing this goal. Therefore, I strongly feel that the very minor tradeoff of a slightly higher but still very low noise floor is well worth the genuine sonic advantage had by minimizing these insidious and pervasive forms of digitally based distortions that have compromised CD sound quality for so long. As lab tester further noted in his “Measurements,” stacking the components could easily degrade the performance of the pair. This illustrates an important point concerning the choice of a two- vs a one-box approach. A recent trend away from two-box digital solutions and back to one-box players has been very evident in CD products. This can easily be explained, as the relatively poor performance of traditional interfaces (AES/ EBU, S/PDIF, etc.) offsets the benefits of the two-box approach. Now, thanks to the Universal I2S interface, we are able to offer all the advantages of two-box solutions (upgradeability, isolation of interfering stages, distribution of tasks) without the added jitter component of conventional digital interfaces. That the well- regarded Miller analyzer could not be used with a DVD-based system such as the 8/296 combination is a true disappointment. (Perhaps an updated version will offer this capability.) However, a single moment’s listening will easily reveal to anyone the substantial improvement that this interface offers. ‘With multichannel capability, secure encryption, master- mode operation, and multi-company support, Universal I2S offers the ideal solution for today and well into the future. Once again, I want to thank you and everyone involved in both the development of these products and the entire high-resolution DVD-based audio effort.